When you hear about popular vacation destinations in California you usually hear about the well known areas such as San Diego, Catalina, Hollywood, San Francisco, and Palm Springs. You don’t usually hear the name “Fort Bragg” in a conversation of someone planning their next vacation. Yet, Northern Californians have been flocking here for years just to relax and enjoy the beautiful scenery. Recently, more and more international travelers have been visiting this area. They are intrigued by the rocky coast and the breathtaking Redwoods that are inland. When we decided to do a Northern California staycation, we originally had our sights set on visiting Mendocino. 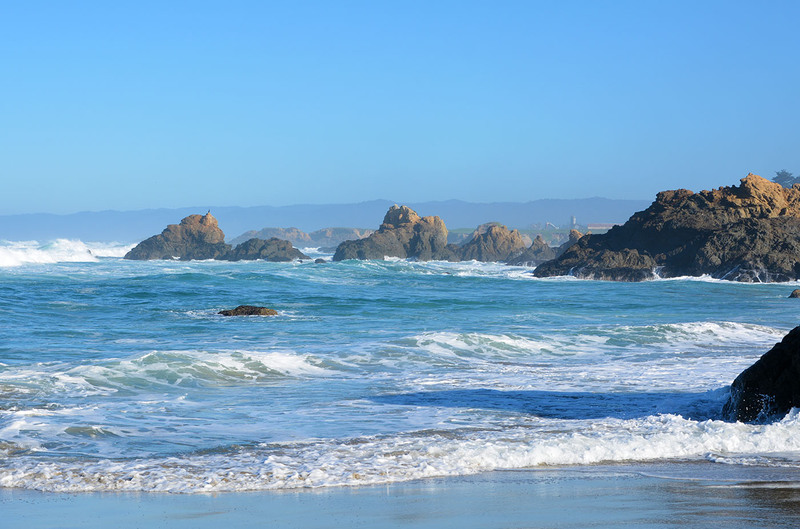 We had seen pictures of Mendocino and the amazing coastline caught our eye. It was nothing short of spectacular from what we could tell from Google photos. So what took us 10-miles north to Fort Bragg instead? It was the hotel. After researching accommodations along the coast, we saw a perfect hotel nestled right on a cliff with a 180 degree view of the ocean, a beach nearby, and an 8-mile trail right out front. So Mendocino was set aside and Fort Bragg it was. We did wander over to Mendocino for the day but that adventure will be told in another staycation story. The hotel turned out to be everything we had hoped for. The Beachcomber Hotel in Fort Bragg has almost every room facing the ocean. Thanks to Oscar at the hotel, we were hooked up with a great room with its own patio, an unobstructed view of the ocean, and an amazing giant Cypress tree right out front. The hotel is dog friendly and even has its own fenced in dog run. I had a cocktail every night as we sat on the patio watching the sunset. It doesn’t get much better than that. Even though it was January, the weather was mild during the day, yet was a little nippy at night. Only a mile from our hotel sits the world famous “Glass Beach.” To make a long story short, back in 1906 a devastating earthquake turned the streets and houses into rubble and debris. Facing all of this wreckage, the locals thought it would be a good idea to use the ocean as a trash dump to carry the debris out to sea. Their hopes were that the ocean would take it all away never to be seen again. However, the debris got trapped in the coves and everything was forced back to shore. Through the years, only the glass remained as well as some pottery and various other, harder materials. The glass that is still here today adds a beautiful backdrop against the rocky shore. It is funny how something so beautiful was created by trash. There are actually 3 different sites. The original site is only accessible by boat or kayak, but the other sites can be found by existing trails. The first cove we went to was a bit of a disappointment as the glass was in smaller pieces and not as abundant. Luckily, a few local residents gave us directions to the second cove where the glass pieces were sizable and in larger quantities. The trail was hidden away and looked steep, but we knew it was safe when we noticed a family with younger kids traversing it very easily. So off we went to find the second cove. When we reached the beach, nobody was there except the family!!!!! I turned the corner and there it was, Glass Beach in all its glory, with the 3-4 inches deep glass everywhere, as promised. They say the third inaccessible cove has knee deep glass but I was happy with this. I admired the different colors of glass and sifted through it as if I were on a treasure hunt. I then shot a few pics and went on my way. A stairway is currently being built at the sight so it will soon be much easier to get to that beach. 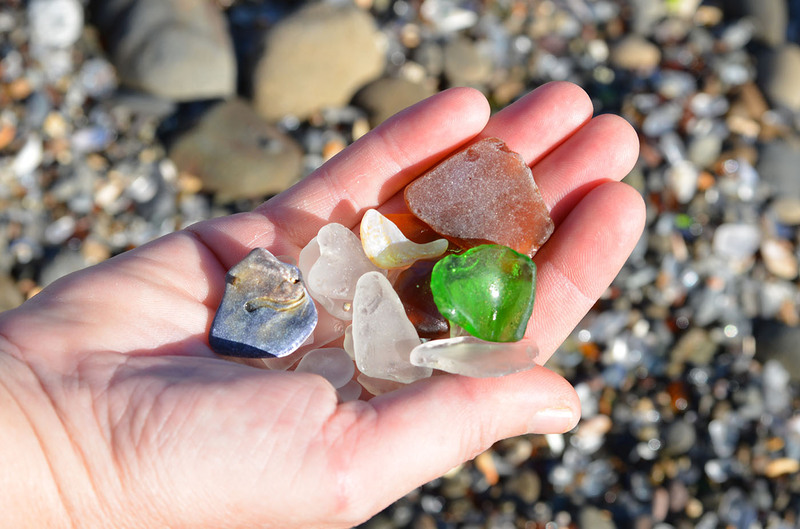 Technically, Glass Beach is part of MacKerricher State Park and it is a misdemeanor to take artifacts from a state park. At this time they are not citing people, but that may one day change as the glass starts to deplete. Near Glass Beach you will find the International Glass Museum where Capt. Sass has legally collected pieces of every size and color glass imaginable as well as porcelain, terracotta, insulators, and other various artifacts. We were grateful for the help from a few local residents who guided us to the other Glass Beach site where we were able to fully enjoy this historical and amazing cove with just a few other people. Fort Bragg was originally a military post on an Indian reservation that was formed in 1857. It was named after a commanding officer by the name of Capt. Braxton Bragg. The reservation was discontinued in 1866 and the land was then opened for settlement three years later. Today’s population is just over 7,000. The locals are friendly and love to talk about their home. We were told that a good portion of the residents are retired and settled down here to relax and enjoy the easy life. They, in part, consist of retired government workers, military, and business people. Yet because of its beauty, it also brings out an eclectic group of people, many who have that creative flair such as artists, sculptors, glass blowers, etc. One interesting local lady told me that if you can’t be creative in Fort Bragg, you might as well head for the ocean and drown yourself. Well, it was something like that but you get the point. As another local described it, the negative ions from the ocean bring life back into people. I don’t even know what to tell you about Noyo Harbor. I have visited many harbors in California and have even lived next to a few, but I have never seen anything like this. Let’s call it, unique. It is a small working harbor with fishing boats lined about. Next to the Noyo River, pleasure boats mixed in with fishing boats are protected by a metal wall that forms a small marina. To satisfy the tourists, the harbor features your usual bay front restaurants, whale watching tours, excursions, bait and tackle shops, and more. There is also a hotel that looks like something out of an old western, a small RV park, and a Buddha Store. Yes, a Buddha store. Not something you would expect to see around a harbor. Amazingly, the shop houses over 10,000 statues of Buddha in various sizes and materials. You can’t leave without visiting this unique store. The harbor looked worn and torn but I loved every bit of it. As I mentioned before, it was rustic. It wasn’t pretentious and didn’t try to be anything more than it was. 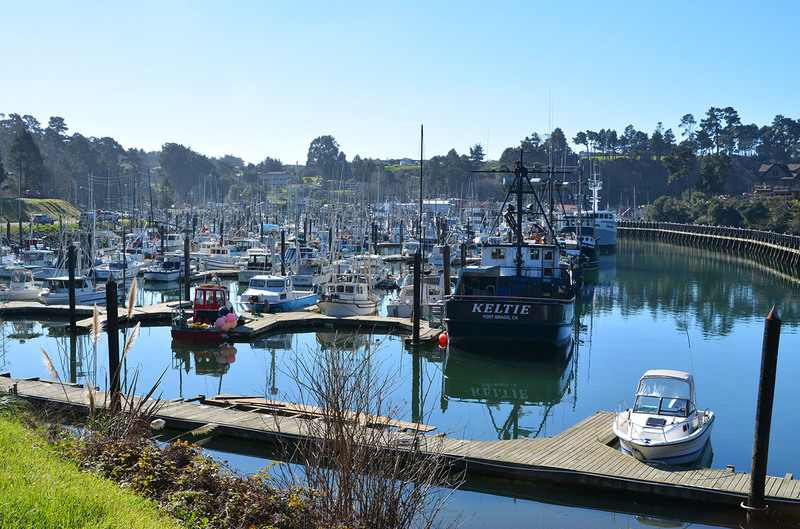 It was so “Fort Bragg.” The Noyo River spilled out into the harbor and it was also lined with a few fishing boats. Some of the boats didn’t even look seaworthy and a dock or two looked like they may collapse at any moment. All of this added to the charm in my opinion. 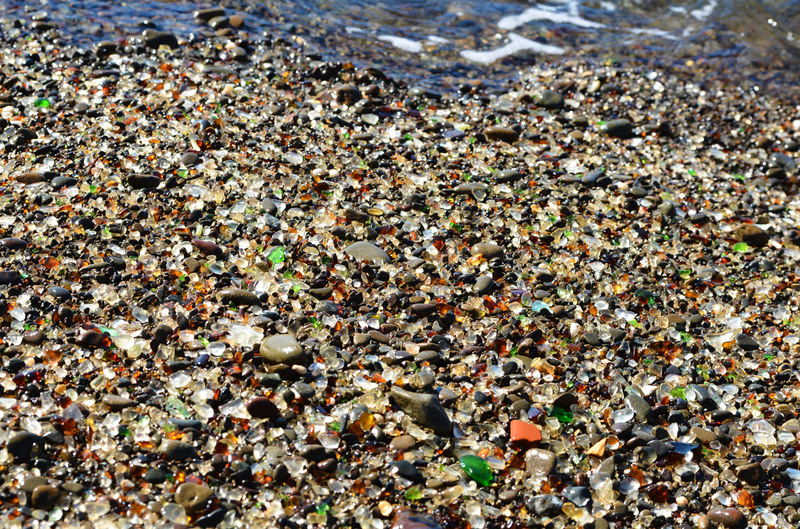 As with “Glass Beach,” you felt the history here. 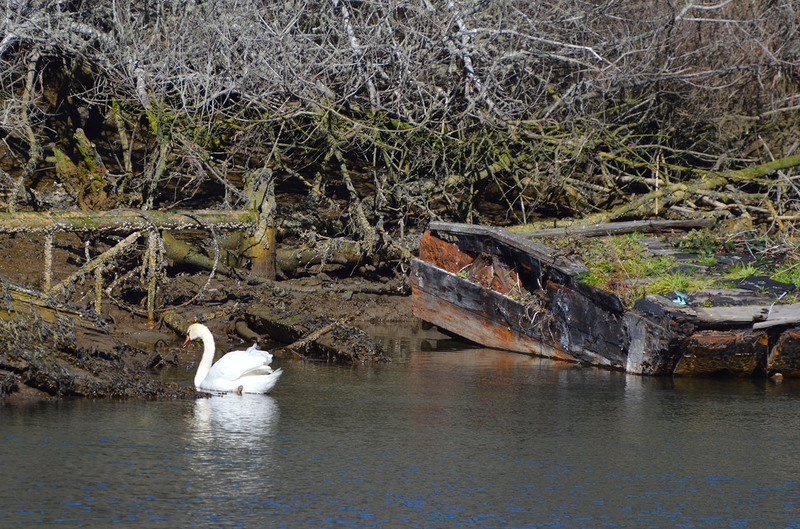 Wildlife was abundant and I enjoyed watching a white swan feed against the backdrop of an old abandoned boat. Although we didn’t do this excursion, it is a very popular attraction in Fort Bragg. The train takes you up into the Redwoods on a 1 ½ hour trip. It’s approximately a 4-hour round trip. Face it, the scenery is the main appeal with the cliffs against the water, the rock formations along the coast, the green meadows, the trees, the expansive white beaches, and the redwoods just a short distance away. It also had a small town feel. A Dollar Tree just opened a few days before we arrived and, of course, every town has to have a Starbucks. They did. There is also a botanical garden and national monuments with waterfalls. There is kayaking and fishing as well as other activities to choose from. It was also named as one of the most dog friendly areas in the U.S.
Migrating south towards Mexico, whales were visible from shore. It felt as though you could reach out and touch them if you were standing on the end of one of the many bluffs in the area. We saw at least 30 whales. They were so close that we could see the air spouts from their blow holes. 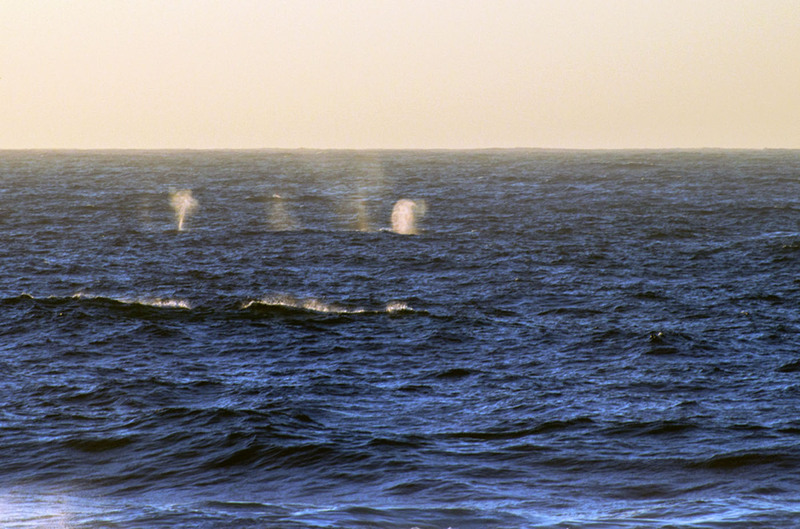 In some cases there were 5-6 whales all bunched up and their spouts would rise above the ocean as if in a mini Las Vegas water show. We saw a few whale watching tours and I am sure they got a great view from the water. It is a long hike if you are coming from Southern California as we were. We took Highway 101 on our way up and I-5 on our way home. On our way up we made an overnight stop in Morro Bay and drove the rest of the way the next day. Expect at least 11 hours of driving time from So Cal. 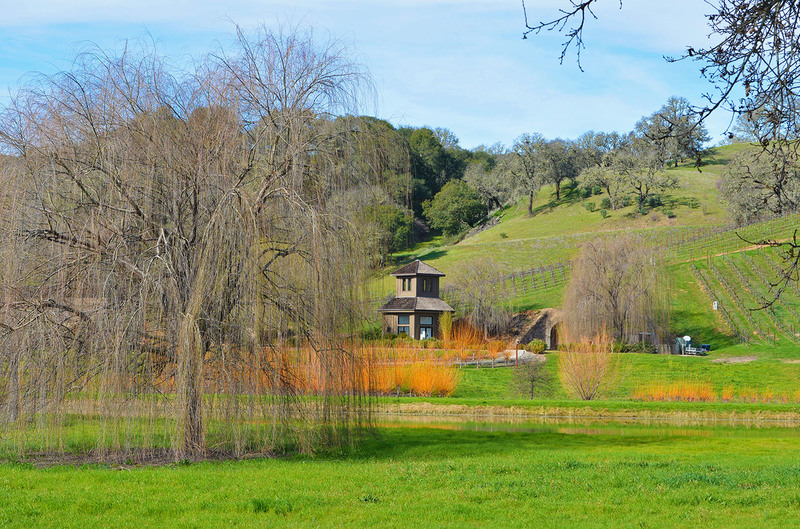 A winding road off of 101 gets you there either by Highway 128 or 20. Highway 20 is the shorter route. Heading back home I grinded it out and drove the whole way. Now I know why the Northern Californians love this place. I wish it was closer to where I live. It has such a different feel from Southern California. I would be there every weekend walking through the colorful glass, bicycling on the bluff trail, photographing everything in sight, or just simply relaxing. Sadly, it is 627 miles away. Not exactly an over-nighter. So, the next time you are planning your California vacation and are debating on where to go, think of Fort Bragg. It might not have all the excitement of San Diego, Hollywood, or Los Angeles but it has scenery to die for, pretty glass, a quaint harbor, and whales!!!! nice to see so many whales for sure.